The present shortage of sugar on the Grenada market is due to the region’s poor transportation system, says Ruel Edwards, Chief Executive Officer of the Marketing and National Importing Board (MNIB). A shipment of sugar was expected to arrive in Grenada more than a fortnight ago but, according to Edwards it is stuck in Trinidad. “We were hoping that the shipment would have arrived last weekend, but right now we have to wait for another week or more for the shipment to get to Grenada,” he said. The sugar shortage first started with brown sugar about a fortnight ago and it was the hope of the MNIB that until the brown sugar arrived, the white would fill the void. However, with the shipment being struck in Trinidad, this has resulted in both brown and white sugar becoming scarce. 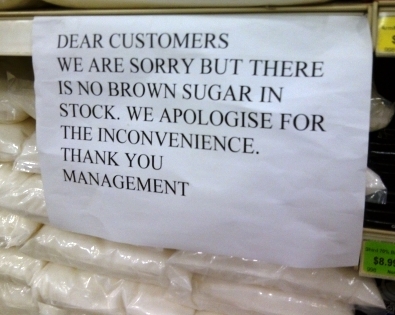 “At present there is no sugar in our warehouse. Shops and other wholesale suppliers may have sugar, but what we don’t know, is how long it will last,” Edwards said. However, the sugar shelves of most supermarkets are empty, with signs saying ‘sorry we are out of sugar’, or ‘sugar not available’. Bakeries are also feeling the effect as sugar based pastries and confectioneries are either in short supply or completely unavailable. The MNIB according to law has the sole authority to import sugar for commercial sale in the country. An individual is allowed to import no more than 10 kilos of sugar for personal use.